Mobile technology and Smartphone devices are the two popular terms that are often used in this busy world. Almost 90 % of the world's population has a smartphone in their hand. The purpose is not only meant for “calling” the other party but there are various other features in the smartphone like camera, Bluetooth, GPS, Wi-FI and also performing several transactions using different mobile applications. Testing the software application developed for mobile devices for their functionality, usability, security, performance, etc is known as Mobile Application Testing. Mobile Application Security Testing includes authentication, authorization, data security, vulnerabilities for hacking, session management, etc. There are various reasons to say why mobile app security testing is important. Few of them are – To prevent fraud attacks on the mobile app, virus or malware infection to the mobile app, to prevent security breaches, etc. So from a business perspective, it is essential to perform security testing, but most of the time testers find it difficult since mobile apps are targeted to multiple devices and platforms. 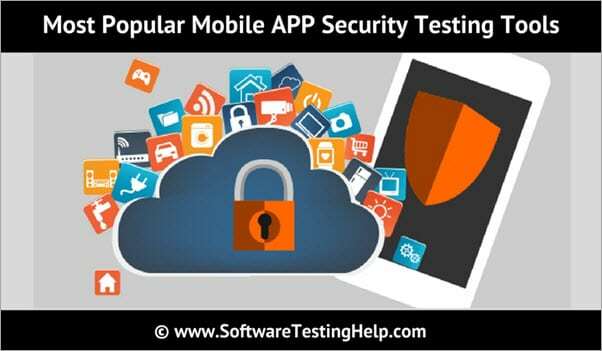 So tester requires mobile app security testing tool which ensures that mobile app is secure. Let’s learn more about the top Mobile APP Security Testing Tools. Zed Attack Proxy (ZAP) is designed in a simple and easy to use manner. Earlier it was used only for web applications to find the vulnerabilities but currently, it is widely used by all the testers for mobile application security testing. ZAP supports sending malicious messages, hence it is easier for the testers to test the security of the mobile apps. This type of testing is possible by sending any request or file through malicious message and test that if a mobile app is vulnerable to the malicious message or not. World’s most popular open source security testing tool. ZAP is actively maintained by hundreds of international volunteers. ZAP is available in 20 different languages. It is an international community-based tool which provides support and includes active development by international volunteers. It is also a great tool for manual security testing. Micro Focus and HPE Software have joined together and they became the largest software company in the world. Micro Focus is headquartered in Newbury, the UK with around 6,000 employees. Its revenue was $1.3 billion as of 2016. Micro Focus primely focused on delivery of enterprise solutions to their customers in the areas of Security & Risk Management, DevOps, Hybrid IT etc. Micro Focus provides end to end mobile app security testing across multiple devices, platforms, networks, servers etc. Fortify is a tool by Micro Focus which secures mobile app before getting installed on a mobile device. Fortify performs comprehensive mobile security testing using a flexible delivery model. Security Testing includes static code analysis and scheduled scan for mobile apps and provides the accurate result. Identify security vulnerabilities across – client, server, and network. Fortify allows standard scan which helps to identify malware. Fortify supports multiple platforms such as Google Android, Apple iOS, Microsoft Windows and Blackberry. Kiuwan provides a 360º approach to mobile app security testing, with the largest technology coverage. Kiuwan security testing includes static code analysis and software composition analysis, with automation at any stage of the SDLC. Coverage of the main languages and popular frameworks for mobile development, with integration at IDE level. LinkedIn is a social networking service company launched in 2002 and is headquartered in California, US. It has a total employee headcount of around 10,000 and revenue of $3 billion as of 2015. QARK stands for “Quick Android Review Kit” and it was developed by LinkedIn. The name itself suggests that it is useful for Android platform to identify security loophole in the mobile app source code and APK files. QARK is a static code analysis tool and provides information about android application related security risk and provides a clear and concise description of issues. QARK generates ADB (Android Debug Bridge) commands which will help to validate the vulnerability that QARK detects. QARK is an open source tool. It provides in-depth information about security vulnerabilities. QARK will generate a report about potential vulnerability and provide information about what to do in order to fix them. It highlights the issue related to the Android version. QARK scans all the components in the mobile app for misconfiguration and security threat. It creates a custom application for testing purposes in the form of APK and identifies the potential issues. Android is an operating system for mobile devices developed by Google. Google is a US-based multinational company that was launched in 1998. It is headquartered in California, the United States with an employee count of more than 72,000. Google's revenue in the year 2017 was $25.8 billion. Android Debug Bridge (ADB) is a command line tool which communicates with the actual connected android device or emulator to assess the security of mobile apps. It is also used as a client-server tool which can be connected to multiple android devices or emulators. It includes “Client” (which sends commands), “daemon” (which runs comma.nds) and “Server” (which manages communication between the Client and the daemon). ADB can be integrated with Google’s Android Studio IDE. Real-time monitoring of system events. It allows operating at the system level using shell commands. ADB communicates with devices using USB, WI-FI, Bluetooth etc. ADB is included in Android SDK package itself. Codified Security was launched in 2015 with its headquarters in London, United Kingdom. Codified Security is a popular testing tool to perform mobile application security testing. It identifies and fixes the security vulnerabilities and ensures that the mobile app is secure to use. It follows a programmatic approach for security testing, which ensures that the mobile app security test results are scalable and reliable. It is an automated testing platform which detects security loopholes in the mobile app code. Codified Security provides real-time feedback. It is supported by machine learning and static code analysis. It supports both Static and Dynamic testing in the mobile app security testing. Code level reporting helps to get the issues in the mobile app’s client-side code. Codified Security supports iOS, Android platform etc. It tests mobile app without actually fetching the source code. The data and source code is hosted on the Google cloud. Files can be uploaded in multiple formats such as APK, IPA etc. MWR InfoSecurity is a Cyber Security consultancy and was launched in 2003. Now it has offices across the globe at US, UK, Singapore and South Africa. It is a fastest growing company which provides cybersecurity services. It provides a solution in different areas like mobile security, security research etc., to all its clients spread across the world. MWR InfoSecurity works with the clients to deliver security programs. Drozer is a mobile app security testing framework developed by MWR InfoSecurity. It identifies the security vulnerabilities in the mobile apps and devices and ensures that the Android devices, mobile apps etc., are secure to use. Drozer takes lesser time to assess the android security-related issues by automating the complex and time taking activities. Drozer is an open source tool. Drozer supports both actual android device and emulators for security testing. It only supports the Android platform. Executes Java enabled code on the device itself. It provides solutions in all areas of cybersecurity. Drozer support can be extended to find and exploit hidden weaknesses. It discovers and interacts with the threat area in an android app. WhiteHat Security is a United State based Software Company established in 2001 and is headquartered in California, USA. It has revenue of around $44 million. In the internet world, the “White Hat” is referred to as ethical computer hacker or computer security expert. WhiteHat Security has been recognized by Gartner as a leader in security testing and has won awards for providing world class services to their customers. It provides services such as web application security testing, mobile app security testing; computer based training solutions, etc. WhiteHat Sentinel Mobile Express is a security testing and assessment platform provided by WhiteHat Security which provides mobile app security solution. WhiteHat Sentinel provides a faster solution using its static and dynamic technology. It is a cloud-based security platform. Sentinel platform provides detailed information and reporting to get the status of the project. Automated static and dynamic mobile app testing, it is able to detect loophole faster than any other tool or platform. Testing is performed on the actual device by installing the mobile app, it does not use any emulators for testing. Gives a clear and concise description of security vulnerabilities and provides a solution. Sentinel can be integrated with CI servers, bug tracking tools, and ALM tools. Synopsys Technology is a US based Software Company that was launched in 1986 and is based out of California, United States. It has a current employee headcount of around 11,000 and revenue of around $2.6 billion as of the financial year 2016. It has offices worldwide, spread across different countries in US, Europe, Middle-East etc. Synopsys provides a comprehensive solution for mobile app security testing. This solution identifies the potential risk in mobile app and ensures that the mobile app is secure to use. There are various issues related to mobile app security, so using static and dynamic tools Synopsys has developed customized mobile app security testing suite. Combine multiple tools to get a most comprehensive solution for mobile app security testing. Focuses on delivering the security defect-free software into the production environment. Synopsys helps to improve the quality and reduces cost. Eliminates security vulnerabilities from the server-side applications and from APIs. It tests vulnerabilities using an embedded software. Static and Dynamic analysis tools are used during mobile app security testing. Veracode is a Software Company based out of Massachusetts, United States and was established in 2006. It has a total employee headcount of around 1,000 and revenue of $30 million. In the year 2017, CA Technologies acquired Veracode. Veracode is providing services for application security to its worldwide customers. Using automated cloud-based service, Veracode provides services for web and mobile application security. Veracode’s Mobile Application Security Testing (MAST) solution identifies the security loopholes in the mobile app and suggests immediate action to perform the resolution. It is easy to use and provides accurate security testing results. Security tests are performed based on the application. Finance and healthcare applications are tested in-depth while the simple web application is tested with a simple scan. In-depth testing is performed using complete coverage of mobile app use cases. Veracode Static Analysis provides fast and accurate code review result. Under a single platform, it provides multiple security analysis which includes static, dynamic and mobile app behavioral analysis. Mobile Security Framework (MobSF) is an automated security testing framework for Android, iOS and Windows platform. It performs static and dynamic analysis for mobile app security testing. Most of the mobile apps are using web services which may have security loophole. MobSF addresses the security-related issues with web services. It is an open source tool for mobile app security testing. Mobile app testing environment can be easily set-up using MobSF. MobSF is hosted in a local environment, so sensitive data never interacts with the cloud. Faster security analysis for mobile apps on all three platforms (Android, iOS, Windows). MobSF supports both binary and Zipped source code. It supports Web API security testing using API Fuzzer. Developers can identify security vulnerabilities during the development phase. Through this article, we learned about the various Mobile APP Security Testing Tools available in the market. It is always important for the testers to elite security testing tools according to the nature and requirement of each mobile application. In our next article, we will discuss more on Mobile Testing Tools (Android and iOS Automation Tools).